Free bead weaving patterns and projects you can make with beads. Here are some free patterns for weaving beaded bags. Here is a selection of free beaded bags you can make: Gold Tiger Amulet Bag, Fringe Pendant Bag, Evening Bag with Ridges. A pdf file containing detailed patterns for beaded bags, necklaces and other items from the Antique Pattern library. My latest handweaving obsession is studying more about the weaving of narrow bands, belts and braids done by my ancestors. After finding a unique double slot weaving reed during a trip to Sweden, I did some more research on these small and portable weaving reeds used by the Saami people of northern Scandinavia. I had seen some photos of weaving reeds in museum collections that had 2 holes instead of one on a small rigid heddle. The additional hole is for the pattern warp thread and makes it easier to weave pickup patterns. The pattern warp thread is picked up to float above the ground weave or pushed down according to the pattern. 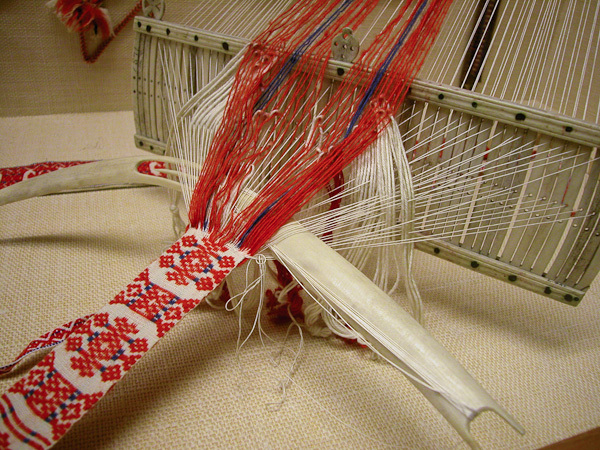 During my research I found a Sami loom maker Stoorstalka who makes traditional Sami style weaving reeds using modern materials. I contacted them about these looms and they very kindly designed a weaving reed to my specification.